Leeds United manager Garry Monk insists that his side can beat anyone in the Championship ahead of the clash at Newcastle tomorrow night. The Elland Road club come north sitting in fifth place, five points above seventh-top Fulham in the race for the play-offs, with five games to go. “I don’t think there is any pressure on us. “We find ourselves in an opportunity where we have got a chance to fight for a play-off position, but we have not got the calculator out. 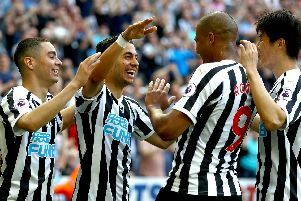 Looking at the Magpies ahead of the 7.45pm kick-off at St James’s Park, Monk said: “They set out at the start of the season to achieve automatic promotion and, in my opinion, they will achieve that. The noisy travelling support could play their part. Monk added: “Away from home, I have seen them take over a few away grounds and really control it! Leeds have Hadi Sacko and former Sunderland midfielder Liam Bridcutt, their captain, available for selection. Meanwhile striker Roofe – a £3million summer signing from Oxford United – is looking forward to the game on Tyneside as Leeds look to nail down a play-off spot. “It is going to be a massive occasion, but it is just another game,” said Roofe. “We are going to do our best and we are confident in what we do, we can only look after ourselves. The game is 50-50. It is 11 versus 11 and they don’t have any more players than us.